If you love horses, helping people, and volunteering in a friendly, outdoor setting, Harmony Farms is for you! Harmony Farms would not be possible without volunteers, since student sessions are labor intensive. Many students require three volunteers: a horse leader and two side walkers during the riding sessions. 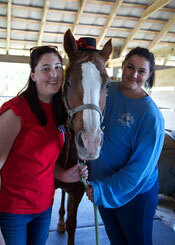 Volunteers are needed to groom and saddle horses, exercises horses, and clean stalls. It is an excellent opportunity to develop new skills, make friends, and have experiences that will be treasured for a lifetime. Volunteers must be at least 13 years of age. No experience is necessary -- we will teach you all you need to know! Flexible schedules are accommodated and no minimum volunteer time is required, except those required by school or other organization requirements. New volunteers can start anytime. Riding Sessions are held on Monday, Wednesday and Saturdays from 8 a.m. - Noon, and Thursdays, 2:30 - 6 p.m. Just show up at one of these sessions to get started. See Volunteer Coordinator Terri Carr. You can then pick other volunteer times once you are registered. You will have to eventually attend an Orientation session, but we like to get you started first. Any questions, send an email Terri at tlcarr29@gmail.com or call her @ 321 543-2974 or call the barn, 321 631-9433.